In 1875, the young William Seward Burroughs (biography of William Seward Burroughs), son of a mechanic from Rochester, New York, according to the father's desire to choose a gentleman's vocation, entered the Cayuga County National Bank of Auburn as a clerk. There he spent long and tedious hours of adding numbers. He was already interested in solving the problem of creating an adding machine, after attending a mathematical lecture in 1872, but now it become an obsession. In the bank there had been a number of earlier prototypes of calculating aids, but in inexperienced users' hands, those that existed would sometimes give incorrect, and at times outrageous, answers. The clerk work was not in accordance with the young man's wishes, for he had a natural love and talent for mechanics and the boredom and monotony of clerical life weighed heavily upon him. Moreover, five years in the bank caused his health came to break and he was forced to resign. In the beginning of 1880 Burroughs was advised by a doctor to move to live in a warmer climate area and to get a more active job, so he moved to St. Louis, where he obtained a job in a machine shop (according to some sources, his father Edmund Burroughs had moved his machine shop in St. Louis in the late 1870s, so William started his new career in his facility). These new surroundings, which appealed to him more (there he met many inventors, including Baldwin), hastened the development of the idea he had already in his mind and the tools of his new craft gave him the opportunity to put into tangible form the first conception of the adding machine. Accuracy was the foundation of his work. No ordinary materials were good enough for his creation. His drawings were made on metal plates which could not stretch or shrink by the smallest fraction of an inch. He worked with hardened tools, sharpened to finest points, and when he struck a center or drew a line, it was done under a microscope. Such attention to detail is important when it comes to building machines, whether they are adding machines or elevators. As much as elevators need to be built meticulously to prevent accidents, adding machines must be designed to always give the correct answers. Burroughs gave up his regular employment and looked around for a small, well-equipped workshop where he could rent bench space and obtain an assistant to carry on his work. 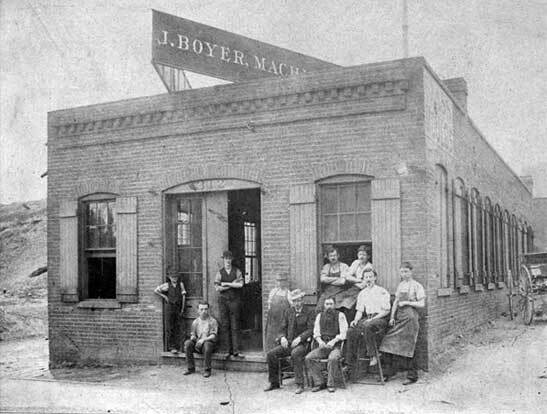 He finally located the shop of Joseph Boyer (see the lower photo), a St. Louis manufacturer of Canadian origin, where he set up his tools and started out to make the adding machine commercially practical. Burroughs started his work with a meager capital of $300, and his funds soon disappeared. Joseph Boyer soon became the greatest factor in making the calculating machine of Burroughs a possibility, supporting and encouraging him. Seldom has an inventor with a great idea been compelled to struggle under such conditions as faced the young inventor during the time he was developing his ideas for the adding machine. He set out himself to raise money by the sale of stock in the projected enterprise. With this money he would then begin his experiments again, but about the time he was well under way, the bottom would drop out of the treasury. However, at the Boyer shop, activities continued unabated in spite of these obstacles. A small organization was built up, which made in brass the adding machine parts which the inventor desired. 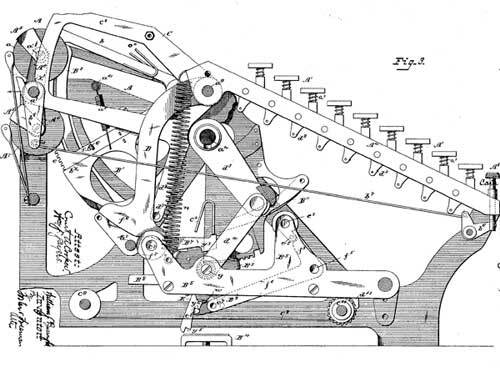 Finally, in the latter part of 1884, the first model of the machine was displayed and was the basis for the Burroughs patents, first of which were applied in 1885 and granted in 1888 (see the lower drawing). First machine was a nine-digit adding device with a printing mechanism, designed to record only the final result of calculation. 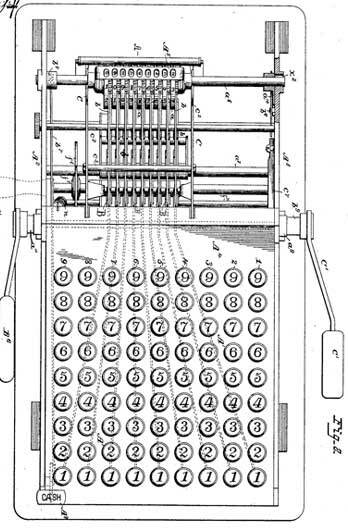 On the same date, but of later application, another patent (with No 388118), was issued to Burroughs, which claimed to combine the recording of the numerical items and the recording of the totals in one machine. There now came a long period of new discouragements. The first machines proved unsatisfactory, principally because the human equation had not been taken into account. One person would operate with a heavier touch than another, consequently the results obtained on the machine varied. The stockholders complained and the general opinion was formed that the new machine was a failure. Furious, Burroughs walked into the stockroom one day and tossed his machines out of the window, one by one. But the setback was only a whip to Burrough's determination. He began work again notwithstanding the fact that he was upon the verge of a physical breakdown. In fact, he did all of his earlier work under the handicap of gradually declining health. At his bench he toiled for hours, without food or sleep, and on the morning of the third day from the beginning, he had eliminated the one great defect by an automatic controller, or dashpot. With this addition, the machine became practical, in that it could be operated by even a novice. Then came the problem of manufacturing and selling the machines. On 20 January, 1888, there was organized at St. Louis the American Arithmometer Company, which was incorporated with a capital stock of $100000. The original officers were: Thomas Metcalfe, president; William S. Burroughs, vice president; Richard M. Scruggs, treasurer; and A. H. B. Oliver, secretary. A contract was entered into with the Boyer Machine Company for the manufacture of the device, the selling operations were established and from time to time different models were put out, the beginning of the long line of models now manufactured. By 1887, Burroughs had manufactured 50 machines. The straight adding and listing machine Burroughs had invented was the company's only product; its purchase price was $475. In 1890 first machines were demonstrated in banks in New York and St. Lewis and some orders were accepted. The first fully functional machine of Burroughs is based on the patent, granted on 5 May, 1892, and it was during this year, that the first large scale production was undertaken. In 1895, sales climbed to 284 machines and a dividend was paid to stockholders. That year Burroughs Adding and Registering Company was established in Nottingham, England, marking the company's first entry into the international marketplace and first ever international company for calculating machines. Between 1895 and 1900, business really took off. Sales jumped to 972 machines and the machine won gold medal at the Paris Exposition. Sadly, Burroughs, who had suffered a lifetime of chronic health problems, died in Citronelle, Alabama, on September 14th, 1898. 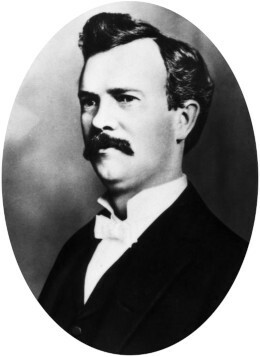 William Joseph E. Boyer, who had supported Burroughs' efforts for many years, became president of the American Arithmometer Company in 1902. In 1904 the company moved to Detroit where it built a huge plant. 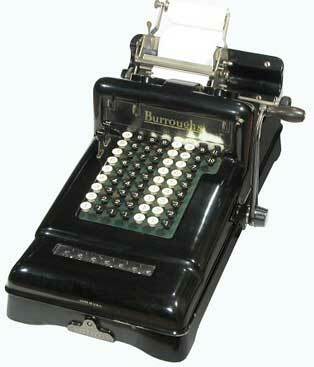 That year the company's name was changed to the Burroughs Adding Machine Company. Next year total sales was 7804 machines and employment rises to 1200. In 1906, Burroughs claimed that as of October 5 of that year, 40000 of its machines were in use in over 30000 concerns and that "ninety per cent of all adding machines sold are Burroughs." In 1908 Burroughs offered 58 models, "One built for every line of business." In 1910 Burroughs machines were already used from over 100000 users. The Burroughs Adding Machine Company had a quite aggressive management and market behavior (later on the company will be sued for "Conspiracy, Attempt to Monopolize and Monopoly"). When a potential competitor with a good machine appeared to the market, Burroughs simply makes a proposal for acquisition, which "cannot be refused". This line of acquisitions began in 1903, when Joseph Boyer secretly enters into an agreement to acquire the Addograph Manufacturing Company, whose director was Hubert Hopkins and was financed by Dalton. The name Hopkins later becomes famous for the Moon–Hopkins machine. In 1908 Burroughs acquired the Universal Adding Machine Company of Missouri, which manufactured the first key-driven electric calculator with 2-color printing tape. In 1909 Burroughs acquired the Pike Adding Machine Company of New Jersey. In 1921 Burroughs purchased the Moon-Hopkins Billing Machine Company of Missouri. 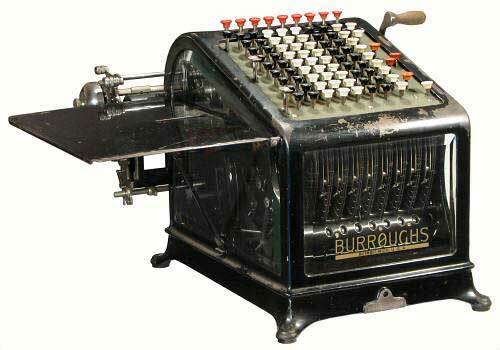 For the next fifty years, Burroughs grew into the largest adding machine company in the world. 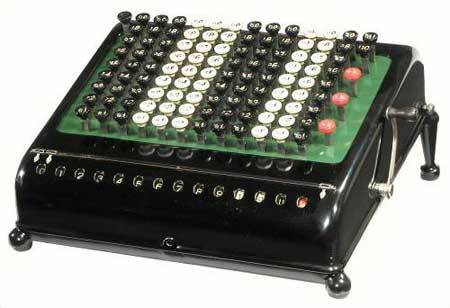 It introduced new products including variations of the basic adding machine, typewriters, check protectors and picketers. In 1953 the Burroughs Adding Machine Company was renamed the Burroughs Corporation, a name more reflective of their broad scope of products, which began to include electronic computers. In 1986, Burroughs Corporation merged with Sperry Corporation to form Unisys Corporation. Class 1 - The original design machine with one calculating mechanism, produced since 1892. Class 2 - machines with two calculating mechanisms, and a special key for transferring a number from one mechanism to the other, produced since 1910. Class 6 - machines with one calculating mechanisms and direct subtraction (not by complemention). These 3 classes are based on the original design of Burroughs and are known as blinding type, because the operator cannot see the printing results from the front of the machine. Others classes of machines carry the Burroughs name, but are not based on the original design of Burroughs. Class 3 - the earlier Pike machine. Class 4 - visible typing machine with special multiplication device for shifting the numbers. Class 5 - non printing Burroughs Calculator (very similar to the Comptometer of Felt), produced since 1911. Class 7 - calculating typewriter, manufactured previously by Moon-Hopkins, produced since 1921. 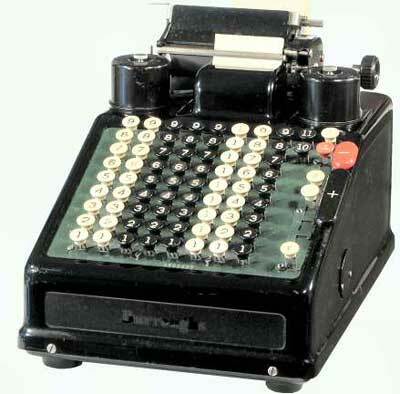 "P" series - a 20-pound "portable" adding machine, introduced in 1925. "J" series - a range of ten-key adding and listing machines, introduced in 1954. The external appearance of the classic Burroughs adding machine changed very little from 1892 into the 1920s (see the lower photo). The distinguishing features are the high sloping keyboard, the beveled glass front, and the printing mechanism out-of-sight at the rear of the machine, which can be put in motion by means of a crank on the right side. There is also a glass front, and the display register is actually inside the casing. Many machines had glass sides as well, to display the internal "rocking segment" mechanism and the ornate cast-iron framework. This particular machine of Class 1 performs addition only, with no provision for subtraction either directly or by addition of complements. There are two large keys on the left-hand side for totals and sub-totals, and three smaller keys for non-add, repeat, and error (or keyboard clear). The red buttons at the top of the machine act as zero keys to clear the individual keyboard columns. •Total key - all sums are indicated with a star, and at the same time the calculating mechanism is set to zero. •Subtotal key: all subtotals are indicated by an S.
•Non add key: all amounts not added, are specially marked. •Correction key: when it is pressed, all the keys that have been pressed down return to their normal position. •Repeat key: this key is useful for repeating actions (add and subtract) for multiplication and division. Although the case shows a remarkable similarity to the Felt & Tarrant's Comptometer, the Burroughs keyboard differs in a number of areas. The ten-shillings column has a full row of "1" keys, while the 10 and 11 pence keys are shifted sideways into the farthings column. There is no key release button, as the machine does not have the mis-operation locking mechanism. There are no subtraction cutoff levers, so it is necessary for the operator to left-fill a complement entry with 9s. A small un-labelled key in the top left corner enters a 9 into the leftmost column. Felt & Tarrant however sued Burroughs for patent infringement based on the similarity of the cases, and Burroughs modified the appearance of its calculator. An eight-column Burroughs Portable from the 1930s (see the upper photo), with direct subtraction and an internal electric motor drive. A small cover plate on the right-hand side can be opened to install a manual operating lever when required. The function keys in the rightmost column are Sub-Total, Total, Non-Add, Repeat and Error (or keyboard clear), with the Add and Subtract bars at the far right.